Have you ever tried a beauty product that truly works? And, you want to run and tell your BFF right away?! Well, I’m going to share with you, my friends, some beauty things that I LOVE and use on a regular basis. 1. Since summer is right around the corner, time to get out the summer clothes! And, show off your already tan bod! I love using Hempz Touch of Summer (Tanning Lotion) as a moisturizer every day. The whole tube lasted me for 3 weeks! (That’s using it on my whole body.) Compared to other tanning lotions and spray can tans…this one is my FAV! *My tip: use regular lotion on your hands (elbows and knees) when using this tanning lotion to prevent the “case of the discolored hands”. Your tan will last up to 3 days! Oh! And water-proof! It doesn’t come off in the shower…as others usually do. 2. 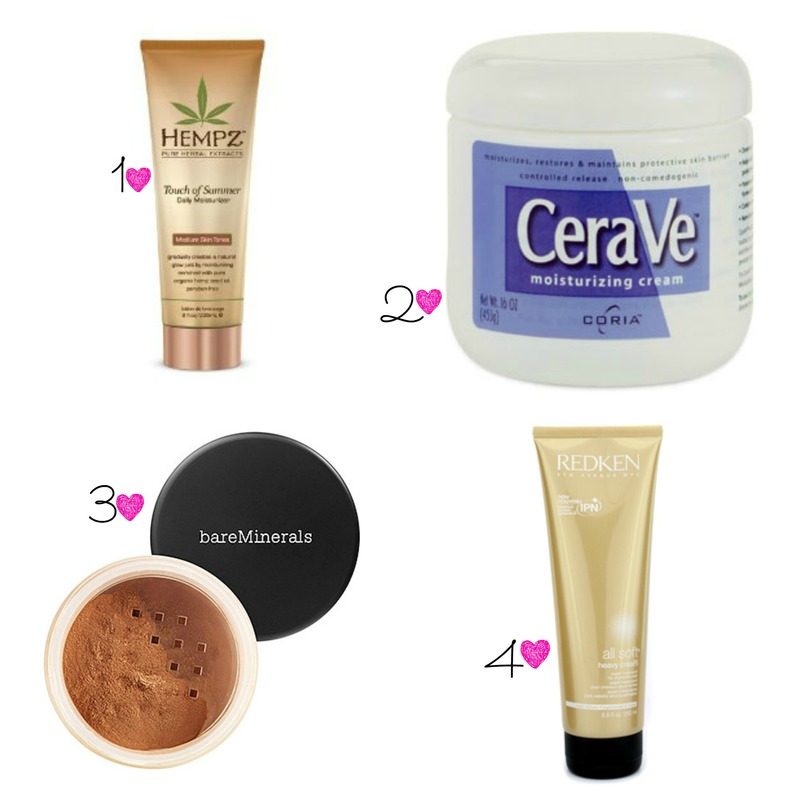 CeraVa Moisturizing Cream is a lotion you do not have to reapply during the day! I even use this as my face moisturizer. Also, on my hands before I put my tanning lotion on. 3. I love brushing on Bare Minerals Bronze on my cheeks, nose and forehead area for a more glow look. Especially in the summer time when you don’t want to tan your face. 4. And finally, Redken Heavy Cream is by far my favorite leave-in conditioner. It doesn’t weigh down your hair at all. Most of the times, I’ll use it everyday and leave it on for 5 minutes. It holds my curls longer during the day without using hairspray! So these are just a few of my favorite things I wanted to share with you! Now you can start getting ready for summer! What are some of your beauty favorites? Redken and that line specfically is great. I have been using “It’s a 10 Miracle Leave-in Spray” for the past couple years…It works like nothing I’ve ever used. Detangles, no grease, no oil, no leaving buildup so you have to wash your hair right away the next day again. Love it. In case you want to cheat on the Redken. Hi Gloria, isn’t CerVe the best moisturizing cream in the entire universe? I love it, too! I also use the heavy cream but I have to use a tiny bit of hairspray to get through the day! I actually switched to Laura Geller’s Bronze and Brighten, which I am really loving. Hope you have a wonderful weekend! Amy @ Fun With Family and Fitness recently posted…Liebster Award!!! The tanning lotion has been my recent favorite…especially with summer coming and showing some more leg…! Hope you guys are having a fun Sunday!